Calling All Skeptics: e-cloth Works! - E-Cloth Inc. Calling All Skeptics: e-cloth Works! We’re here to show you that e-cloth is different! 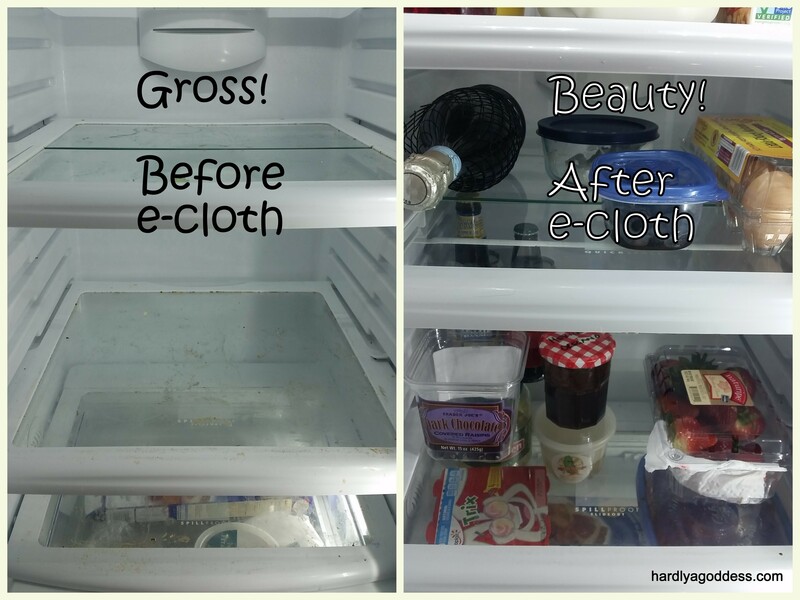 e-cloth cleans better than what you’re currently using in less time using just water. the fibers – the more fibers the better the cloth performs. Barrie at Hardly A Goddess was also a skeptic at first, but her experience with e-cloth’s Kitchen Pack quickly changed her mind. Better for the environment- no more paper towels! I have used brands of microfiber, easily available at the big-box stores, that give me a weird feeling on my hands, or just kind of push the dirt around, so I just stop using them- Or they don’t really do anymore than a regular rag would do. So, I didn’t really expect much from these e-cloths to be perfectly honest. Well, I am happy to say that not only was I wrong, but I am so, so, so glad that I found these! Everyone that comes in my house gets a little demo- very annoying, but I just love these cloths! The window cloth, is also the stainless steel cloth- It is amazing! I just wet it and wiped. Now, I have, of late been not liking my stainless steal appliances for the simple reason, that they get dirty with fingerprints constantly. 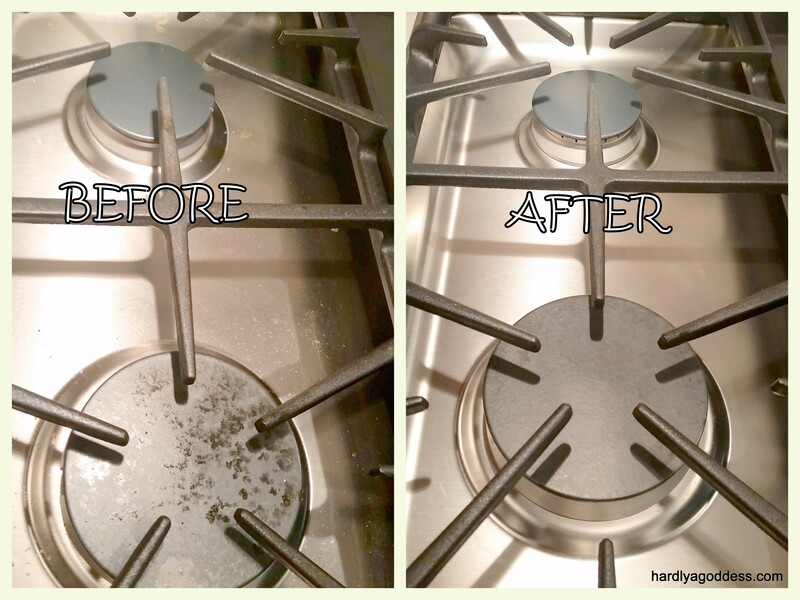 Sticky fingers abound in my house and the chemicals used in the stainless cleaners are really smelly, toxic and expensive. I kind of get grossed out with the residue they leave on my hands. With the e-cloth- I just wet it, squeezed the extra water out and wiped. Done. Those who have been in my house lately, may have noticed that there are fuzz-balls gathering in the corners, but my kitchen is sparkling! It is very motivating to get new cleaning tools or products that make you feel that you are doing something good for your house! I gave my little demo to my husband on our windows…people, we are 4 years in this house and windows are not my priority. They may get a total overhaul. I used the same stainless cloth and wet it again, and wiped the window. It looks streaky at first, and you would think that it would dry that way too, but it dries crystal clear. This is kind of a game changer for me. I really always feel pulled away from the “good” environmentally safe products, in order to feel like my house is really disinfected…No more. I still will use my products in the bathroom, but those mirrors are strictly being cleaned with the glass cloth- it is so easy and BETTER than the chemicals. Better. I cannot say enough about these cloths, only that I am going to buy more of them myself, and give them as house-warming gifts! I hope they send me more to review, so I actually want to clean my whole house, and not just my kitchen! I am so thankful for the opportunity to try the e-cloth brand of microfiber cloths and I have to say, I will never give them back. Never. They are my new favorite thing that I have- ever. Maybe I don’t get out much, but in the day to day regularity of cleaning my kitchen- these bad boys have my total love and support! 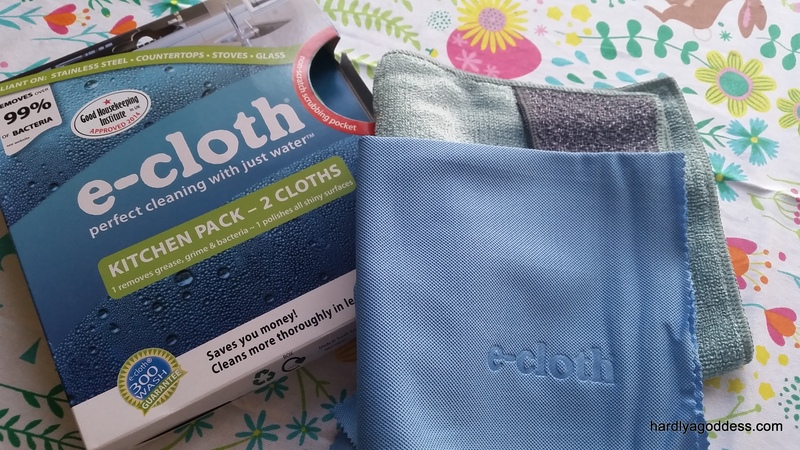 E-cloth sent me a Kitchen Pack which includes: one (1) 12.5″x12.5″ Kitchen Cloth and one (1)20″x16″ Glass & Polishing Cloth. The glass and polishing cloth can be used on glass, mirror, stainless steel, chrome, granite, marble, and other shiny surfaces. The e-cloths are by my standards, very environmentally friendly. They eliminate the need for atleast 4 really harsh chemicals that would do the same jobs that these two cloths do. They make cleaning easy. Puleese. I hate cleaning. These make it easy for real. My kids can’t get injured by accident if they use them- chemicals would land them in the hospital- these cloths just land them…well, on top of some cloths. By making them extremely kid friendly, they can help me clean without worry. My kids can help me, I said. Chores can be done. Whoot! I can eat off a surface that I know is free of germs and chemicals. Knowing they get rid of 99% of germs and don’t just spread them around makes me feel like my house is actually clean and not just wiped. I can wash those germs right down my sink on a daily basis, and also wash my cloths thoroughly once a week, as they are tested for up to 300 machine washes! Now, after I had totally soaked the glass cloth, I had read that you were supposed to spray your surface with water and then use the cloth. Or I could use the regular kitchen cloth and then the glass cloth to shine the surface and wipe it dry. But…because I am “Hardly A Goddess” this isn’t how it worked out. I just rushed ahead and used my soaked cloth all over a mirror, some windows, the stainless….”What did I just do?” I thought. Then I saw how clean it all was. And streak free. And that was really easy. So, I may have done it wrong the first time, but it worked so well, I went around and started wiping all the windows on my first floor. It was a little crazy, but also very satisfying to see how easily I could make things clean. As an FYI, e-cloth was voted “BEST Cleaning Cloth & BEST Washable Mop” by REAL SIMPLE magazine. For what it’s worth. Just saying.